I haven't been very timely with these posts lately, have I? Actually, it's not due to laziness, I've been busy the last few days preparing for a party my daughter had here with some of her friends last night, and my internet went wonky yesterday, too. I guess everyone was home streaming movies on Netflix or shopping on Amazon! 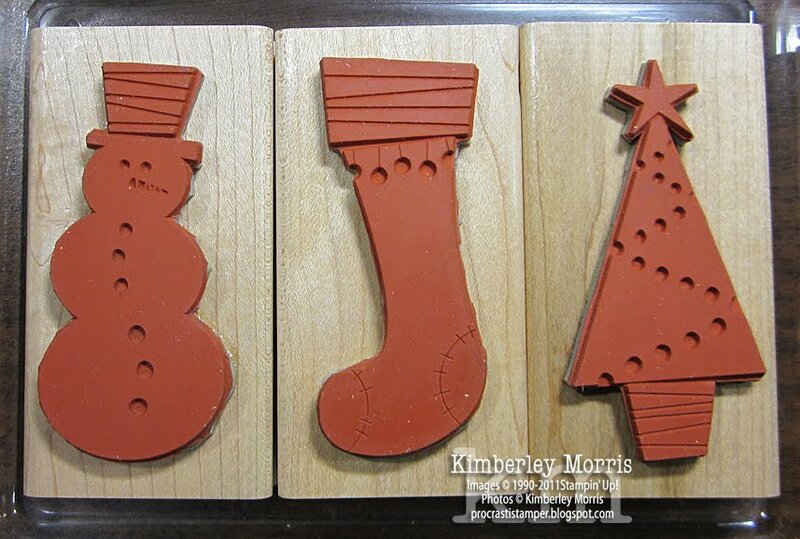 So, I'm going to do something different for Days 8 & 9 of my Twelve Days of Blog Candy 2011. I'm going to give away a free printable sheet of gift tags for EVERYONE! 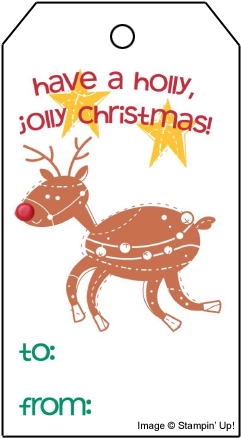 I used some pre-made designer template images from the Home for the Holidays Ensemble digital download for My Digital Studio® and pasted the "To-From" tags to fill up one whole page, then turned that into a PDF for you. 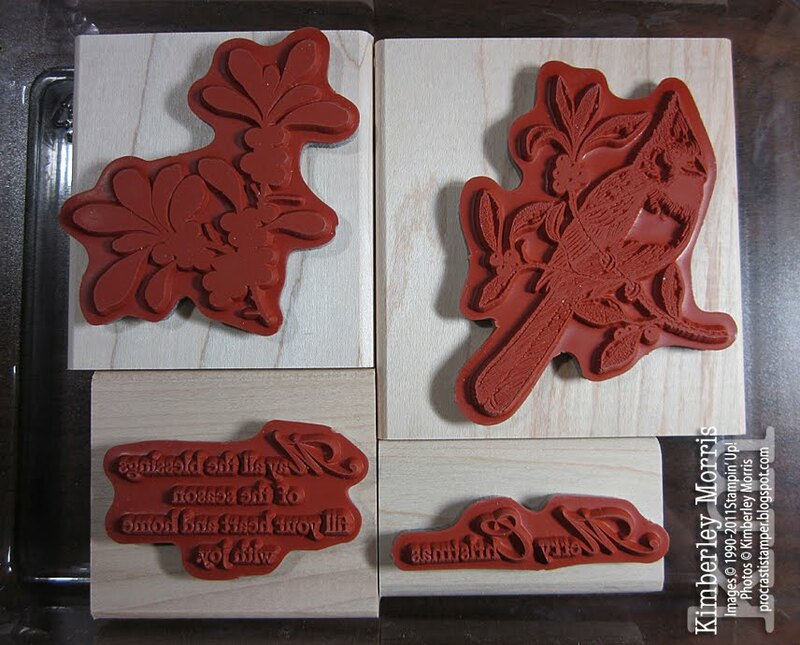 These are ready to print out, and you can hand trim them out as circles, or you can use any of several punches. 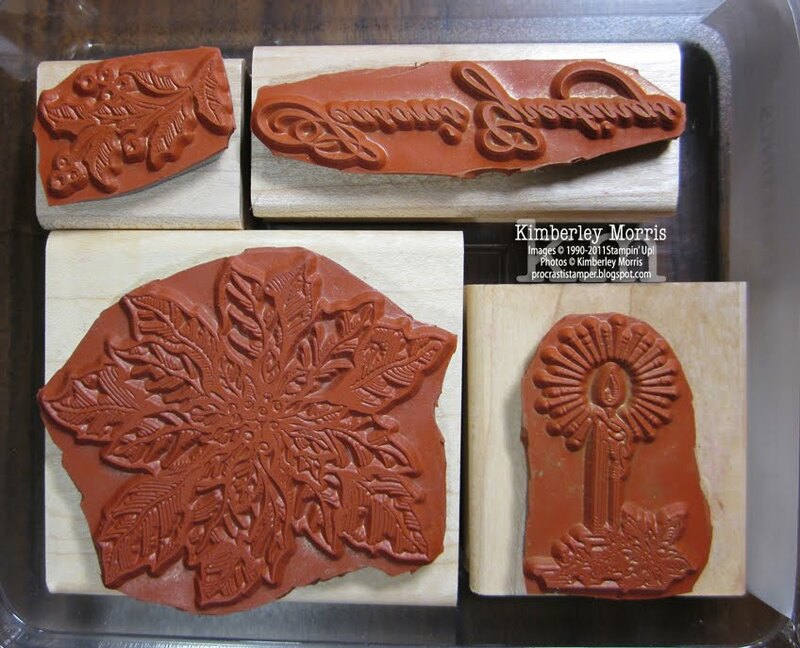 The punches used on the tags below are (clockwise from top): 1-3/4" Circle, Ornament, Full Heart, Decorative Label, 1-3/4" Scallop Circle. I printed these out on Whisper White card stock, making sure to print the PDF at full size. To do that, ensure the print dialog is set as Page Scaling: None. 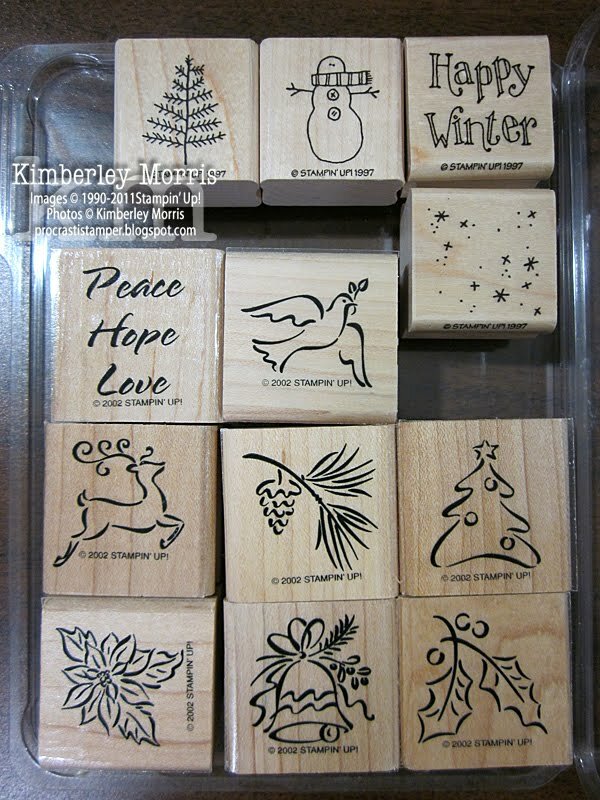 Be sure to check back tomorrow morning for another stamp set giveaway in my Twelve Days of Blog Candy 2011! I think I might giveaway the set with the elves tomorrow...it's so cute!!! Is there a set you're waiting to see me give away? If so, leave me your comment below with the set name. You never know, Santa may be reading my blog! 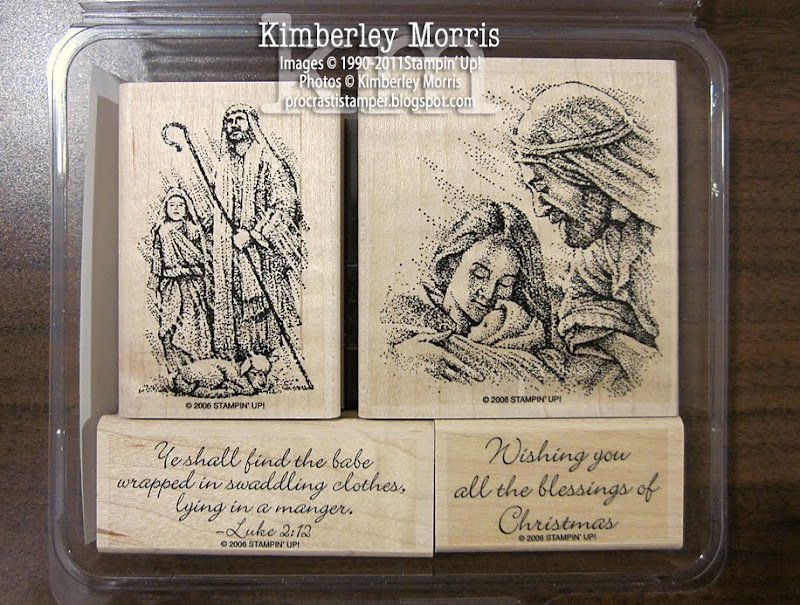 Okay...back on schedule now...here is my giveaway for Day 7 of Twelve Days of Blog Candy 2011. You must read and follow the rules posted HERE. Please remember that you must put your first and last name, and email address, in the body of the comment, or your entry may be disqualified. Good Luck! And remember, you can get 10 Bonus Entries in each day's giveaway when you make a purchase from my ONLINE STORE during my Twelve Days of Blog Candy 2011! NOTE: You must enter this giveaway by commenting below, no later than 6:59am MST on December 20, 2011. See rules for format of comment entries HERE. Okay, I sort of took a "day off" yesterday, so today we'll actually have two days of blog candy to give away. This is the Day 6 giveaway...be sure to also check out the Day 5 giveaway, which has the same entry deadline! Here is my giveaway for Day 6 of Twelve Days of Blog Candy 2011. You must read and follow the rules posted HERE. Please remember that you must put your first and last name, and email address, in the body of the comment, or your entry may be disqualified. NOTE: You must enter this giveaway by commenting below, no later than 6:59am MST on December 19, 2011. See rules for format of comment entries HERE. Okay, I sort of took a "day off" yesterday, so today we'll actually have two days of blog candy to give away. This is the belated Day 5 giveaway...be sure to also check out the Day 6 giveaway, which has the same entry deadline! 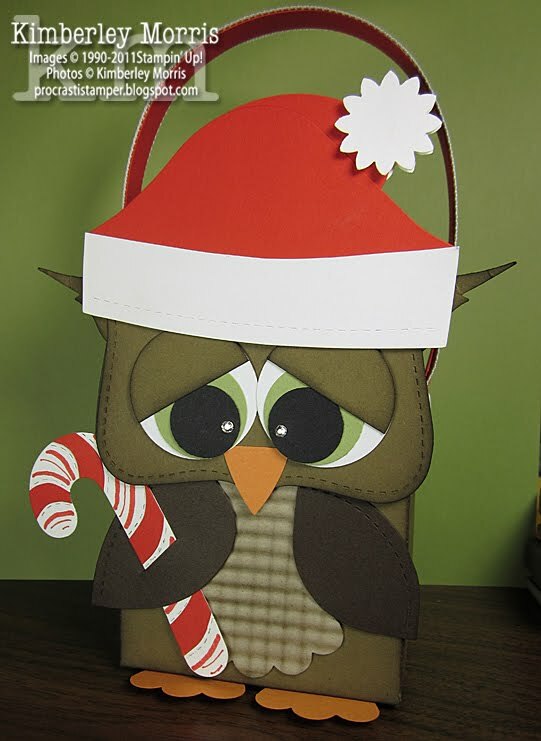 Here is my giveaway for Day 5 of Twelve Days of Blog Candy 2011. You must read and follow the rules posted HERE. Please remember that you must put your first and last name, and email address, in the body of the comment, or your entry may be disqualified. 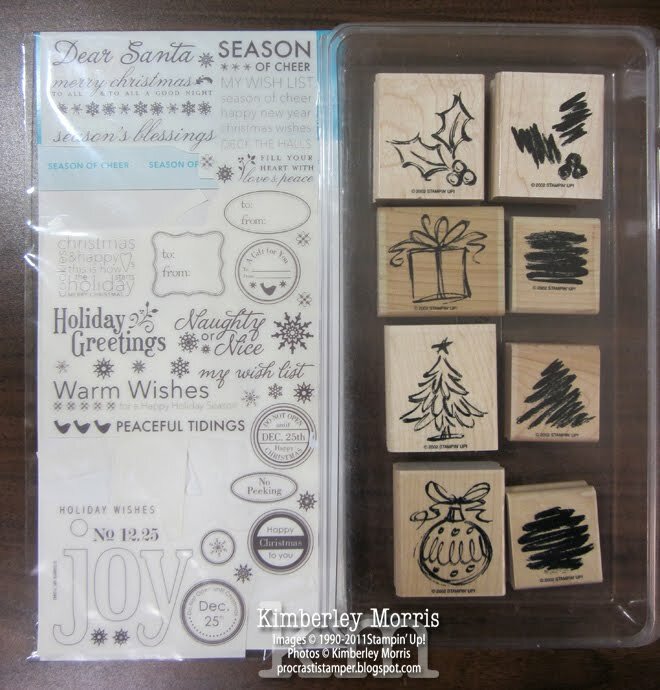 Okay, I absolutely had to have the Polar Party stamp set...it has the cute polar bear you see below, and also some holiday items like trees, gifts, and there are also two little penguins in the set! I really bought it solely because the penguins were so cute, and I thought that might be all I'd use from the set. But as I was making this project, I noticed that the polar bear fit perfectly within the frame, so he's my favorite in the set for now. 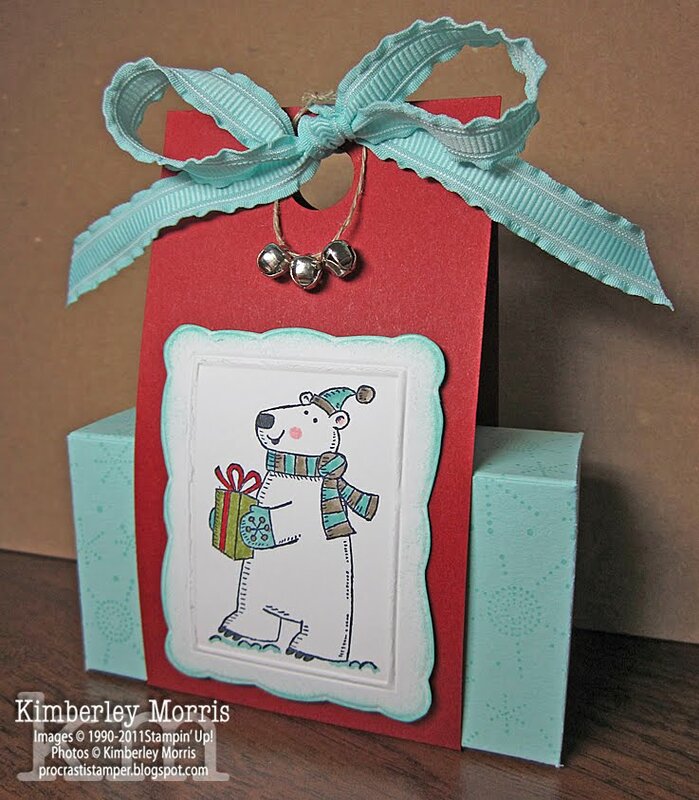 The dangling Mini Jingle Bells really complete this project! I'm having a hard time with my lighting lately, so you'll have to trust me when I say this project looks super cute in real life! 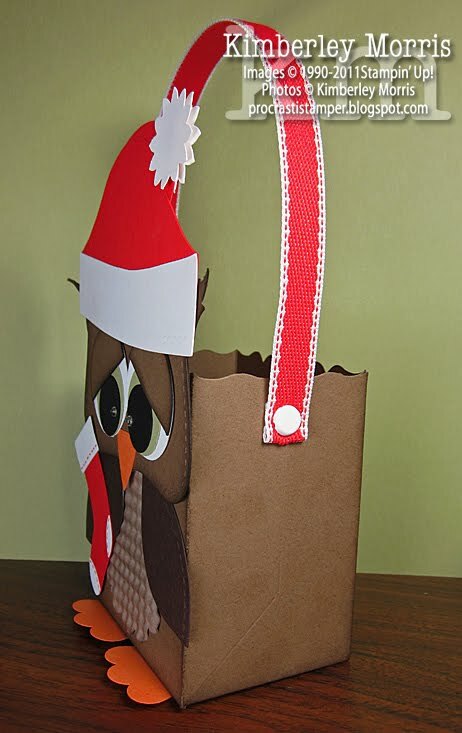 This is a variation on a box I made previously--you can find the relevant dimensions on THIS BLOG POST. I chose to make these for my daughter to take to school for her teachers and friends, because the box is not attached to the little wraparound strip. See, we've made adorable treat containers before, and her friends just ripped them apart in their haste to get the candies. This way, they just slide the box out and open it...and our loving handiwork remains intact, so others can covet the packaging :-) I put some Merci chocolates inside, they were on sale at our corner Walgreens (usually $8 box, on sale 2 for $7). Eight of the individual chocolates fit in each treat box without any trouble or special care as to arrangement, and they are YUMMY. 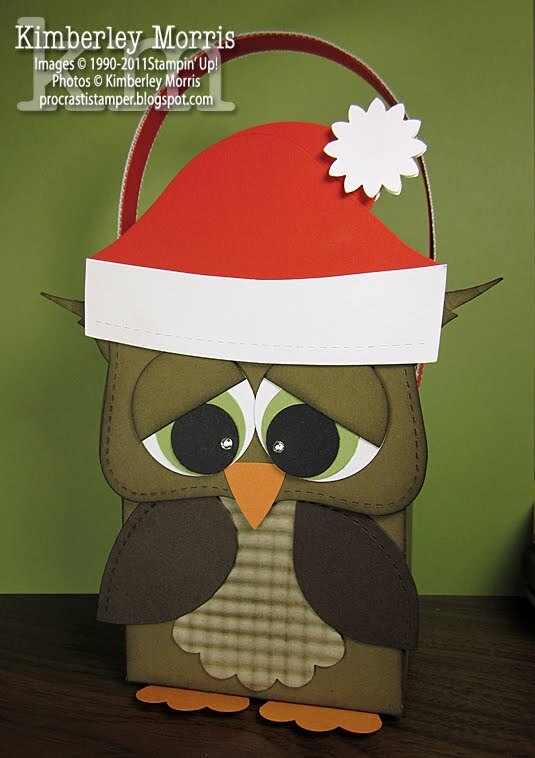 I also just wanted to say that it's not too late to do some holiday crafting. I whipped out 10 of these simple and easy boxes from 4:00 to 6:00 this morning. (It's my daughter's last day of school til after Winter Break, so I had to get them done before I took her to the bus stop!) 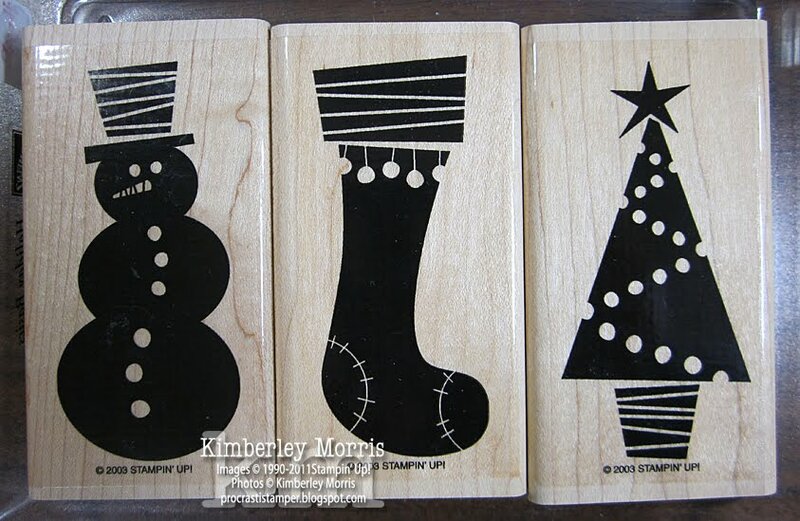 The designing is the hardest part, and I've already done that for you :-) The great thing about this Polar Party stamp set is that you can use the penguins and polar bear all winter long. Let's say you are too booked up with holiday chores and events right now and don't get your treats made until after Christmas. No problem, it's still winter for a few more months, and you can't tell me there's anyone who would not LOVE to get this little treat box as a "thinking of you" gift in January!!! Stampin' Supplies: Polar Party stamp set, Sassy Sparkles Jumbo Wheel, Pool Party card stock, Pool Party ink pad & marker, Pool Party Ruffled Ribbon, Basic Black ink pad, Whisper White card stock, Cherry Cobbler card stock, Lucky Limeade marker, Real Red marker, Crumb Cake marker, Basic Grey marker, Pink Pirouette marker, Stampin' Sponge, Mini Jingle Bells, Linen Thread, 1/2" Circle Punch, Box #2 die (used with Big Shot), Textured Impressions Designer Frames Embossing Folder (used with Big Shot), Stampin' Dimensionals, Tombow Multipurpose Glue. 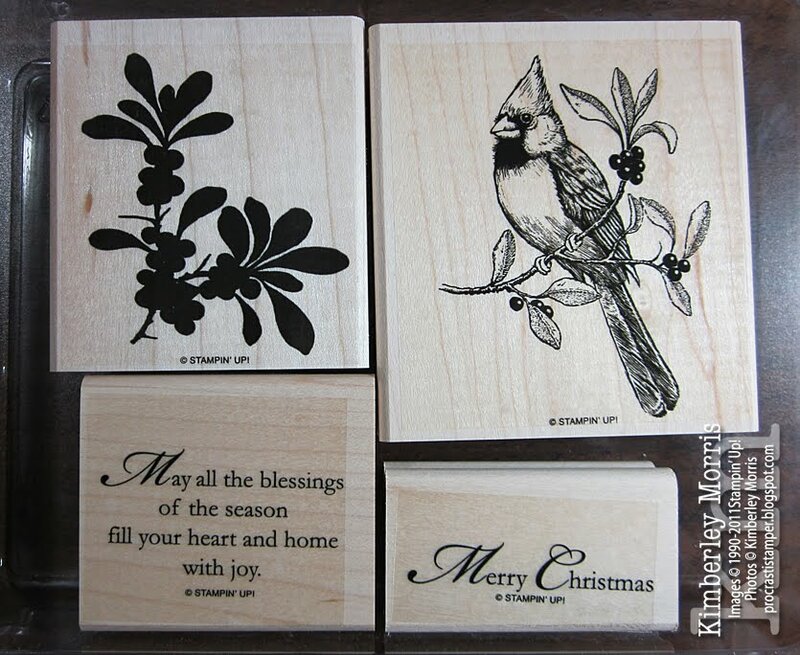 Here is my giveaway for Day 4 of Twelve Days of Blog Candy 2011. You must read and follow the rules posted HERE. Please remember that you must put your first and last name, and email address, in the body of the comment, or your entry may be disqualified. NOTE: You must enter this giveaway by commenting below, no later than 6:59am MST on December 17, 2011. See rules for format of comment entries HERE. 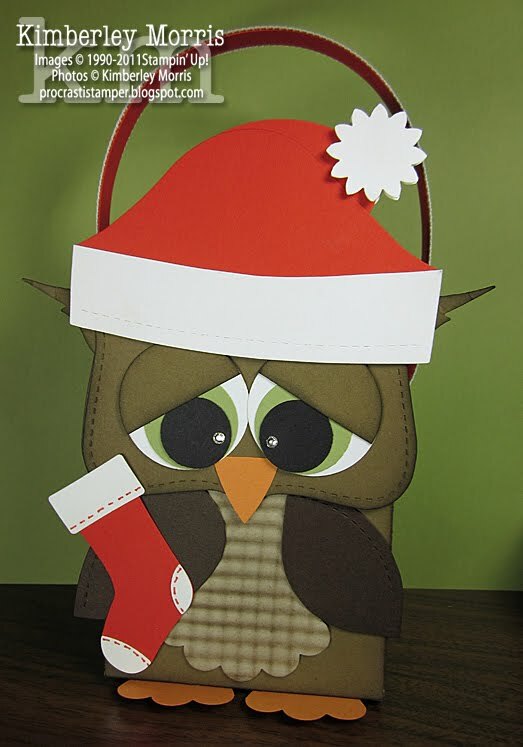 Anyway, here is my giveaway for Day 3 of Twelve Days of Blog Candy 2011. You must read and follow the rules posted HERE. NOTE: You must enter this giveaway by commenting below, no later than 6:59am MST on December 16, 2011. See rules for format of comment entries HERE. 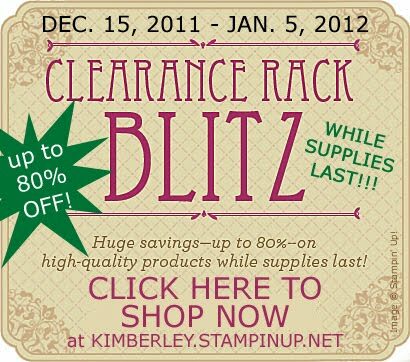 CLEARANCE RACK BLITZ - Up to 80% OFF! 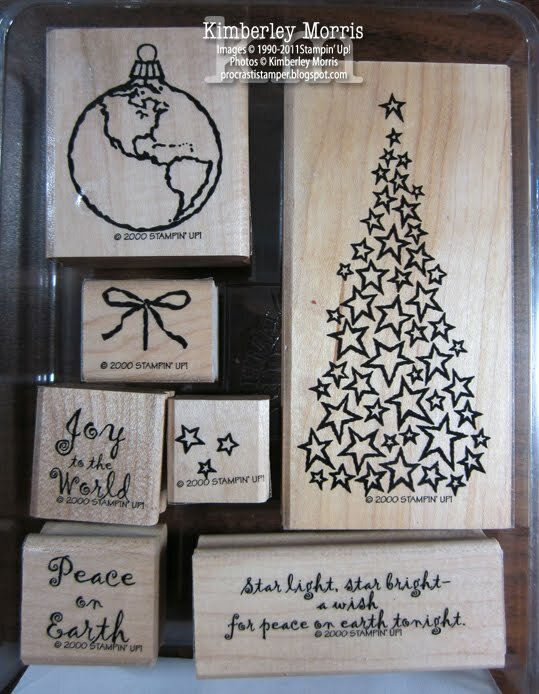 Starting today, December 15, 2011 and going through January 5, 2012 you can buy items from my Stampin' Up! Clearance Rack at up to 80% OFF Retail--HURRY, it's while supplies last!!! The Clearance Rack includes old body style punches (also known as thumb punches or "whale" punches), many of which are still sold at full price in the current catalog, as the new style "flat" or "locking" punches. There are many circle and square punch sizes, so stock up now while they last at these LOW, LOW prices! 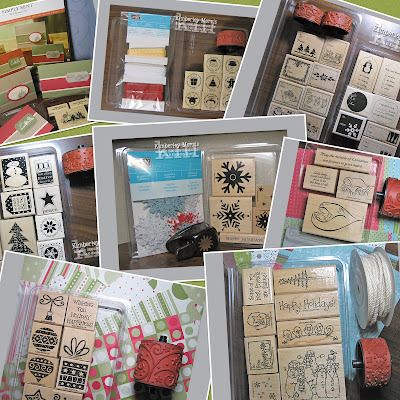 There is no minimum purchase to qualify for these great prices, and all your purchases count towards Stampin' Rewards Benefits (free dollars to spend!). You can even combine your Clearance Rack purchases with other purchases from my ONLINE STORE, including current catalog items! Nearly 200 new items have been added to the Clearance Rack for this special sale! There are some super 8x8 Scrapbook Albums, tons of fun Rub-Ons for every occasion, lots of different Ribbon, great prices on Designer Series Papers, tons of On Board chipboard, several Build-A-Bear products, and there are even some Simply Sent Card Kits! Following the Clearance Rack Blitz sales period, some items may remain in the Clearance Rack, and others may be removed...and could reappear at an undesignated time in the future, but there are no absolutes. Items are available only WHILE SUPPLIES LAST, so SHOP NOW to be certain you get the products you want. LAST DAY FOR $50 OFF STARTER KIT!!! This special offer is available from me on December 13th and December 14th ONLY! 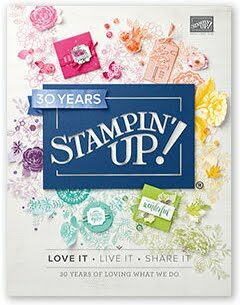 When you PURCHASE A STARTER KIT I am authorized to offer to you a $50 DISCOUNT and your choice of up to $120 in FREE add-on product (if you choose Designer Series Paper)!!! Along with the Bonus Personal Offer I am extending below, you can receive $500 in product when you Purchase a Starter Kit from me for only $125...December 13th or 14th ONLY. Because the deadline is today, you will need to sign up online--click here to Use My Website to sign up to Become a Demonstrator. 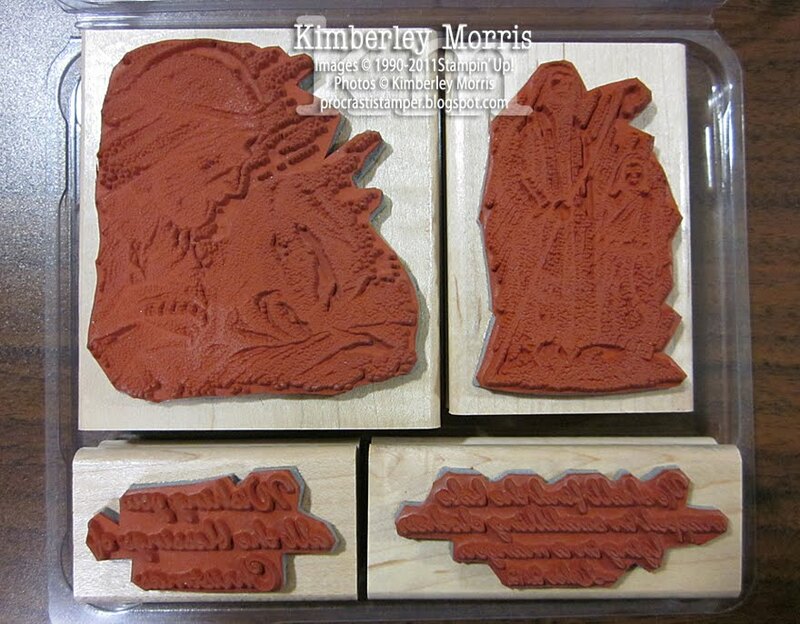 Use My Website to sign up to Become a Demonstrator. BONUS PERSONAL OFFER: I still have extra My Digital Studio Software, and Content Discs that were not claimed in November. 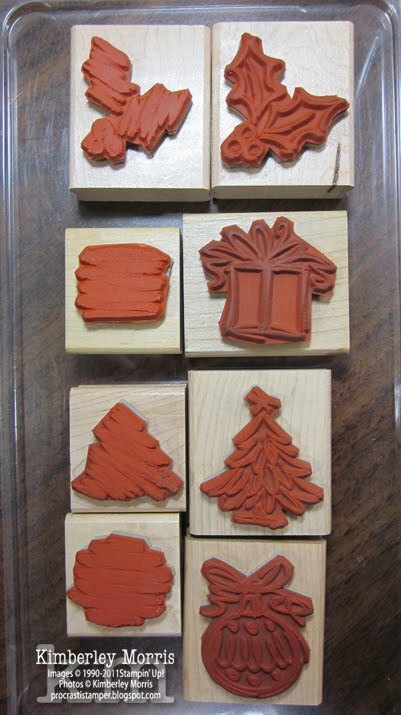 I am giving those away to the first and second individuals who Become a Demonstrator on December 13th and December 14th. See this previous post for details. 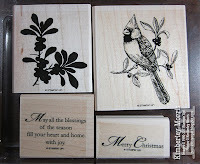 Here is my giveaway for Day 2 of Twelve Days of Blog Candy 2011. You must read and follow the rules posted HERE. NOTE: You must enter this giveaway by commenting below, no later than 6:59am MST on December 15, 2011. See rules for format of comment entries HERE. 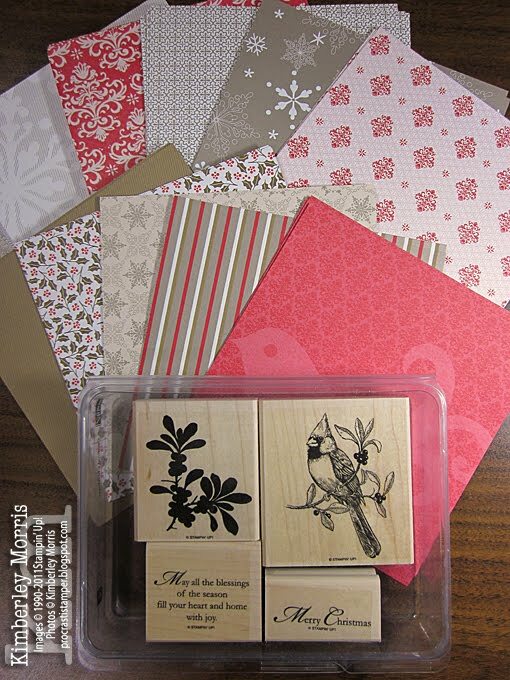 Here is my giveaway for Day 1 of Twelve Days of Blog Candy 2011. You must read and follow the rules posted HERE. NOTE: You must enter this giveaway by commenting below, no later than 5:59am MST on December 14, 2011. See rules for format of comment entries HERE. I got this idea a couple years ago from the Ellen DeGeneres Show's 12 Days of Giveaways, and decided to host my very own Twelve Days of Blog Candy Giveaways! You'll want to Subscribe to My Blog in a Reader, or Subscribe to My Blog in Email, to ensure you don't miss a single one of my Twelve Days of Blog Candy! 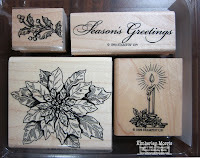 I have a dozen stamping prizes, one each day, that I will give away from December 13th through December 24th, 2011. 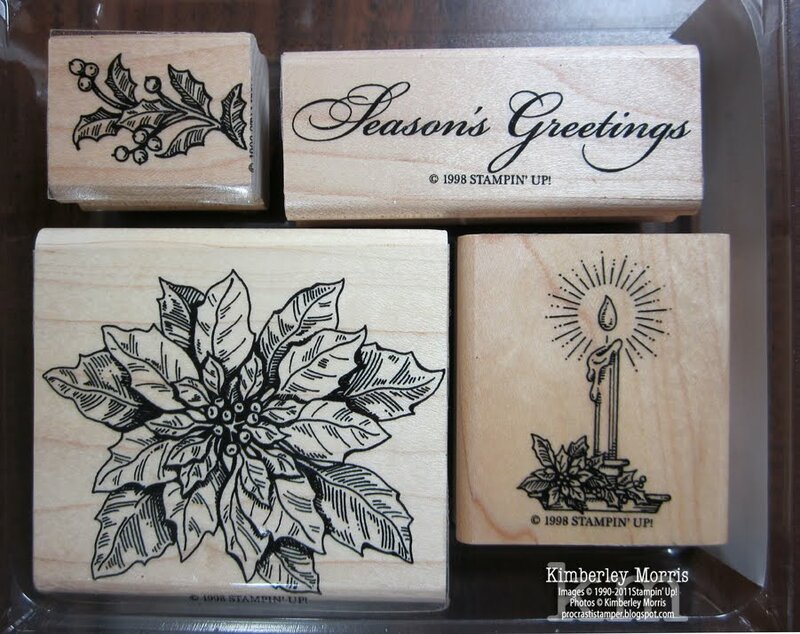 Each prize will feature at least one stamp set, and possibly/probably some great holiday accessories and/or embellishments. 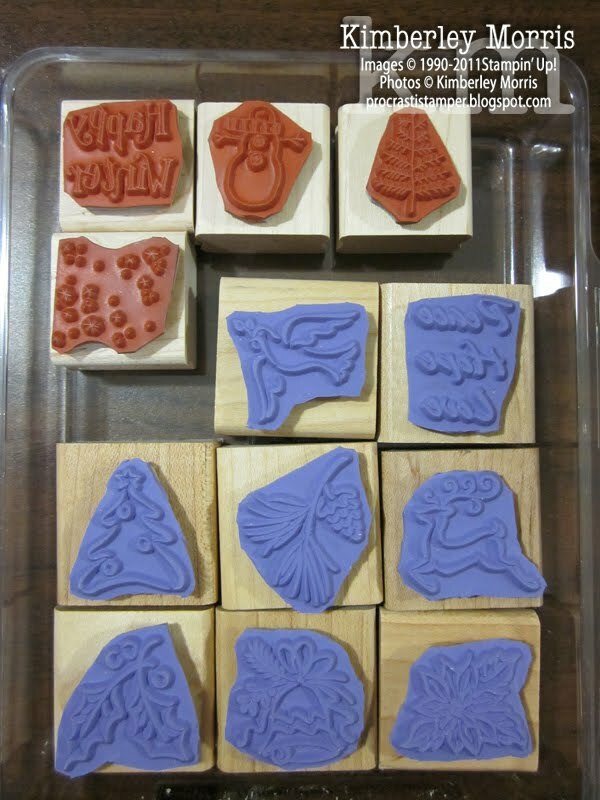 These stamp sets are not brand new but are in excellent condition. Don't worry, I'll put separate pictures up each day of what the winner will be receiving, so you can choose what you'd like win! 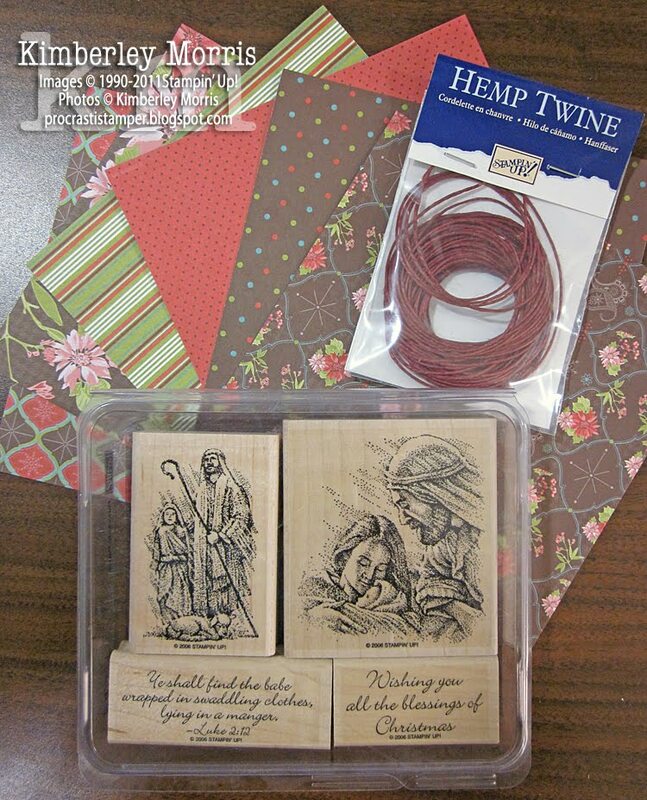 You will get what's pictured and described, but I reserve the right to toss extra goodies in the package if I'm so moved ;-) I may also give away discontinued patterned paper, ribbons, and other accessories and embellishments with any or all stamp sets. 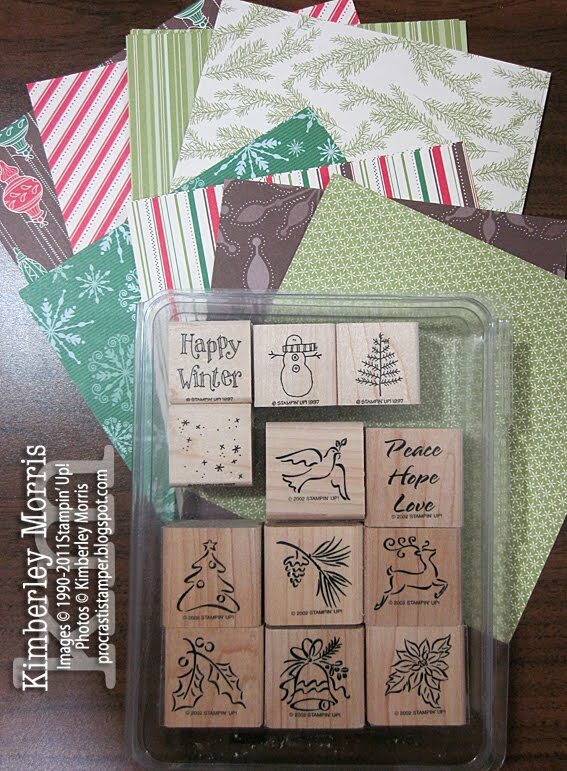 Giveaway stamp sets this year tenatively will be: Snow Angels, Christmas Punch, Holiday Basics, Heavenly Peace, Supersize Snowflake (double-sided background stamp), Santa's Helpers (oh my gosh these elves are the cutest! 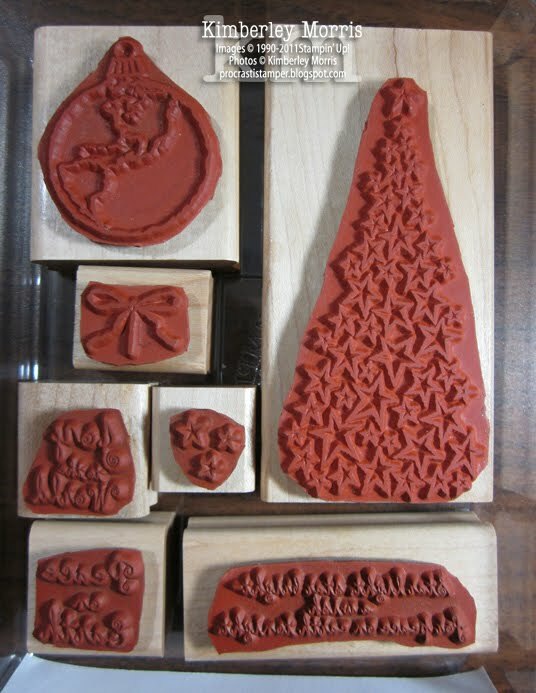 ), Patterned Pines, Season's Sketches, Peace on Earth, A Cardinal Christmas, Holiday Minis & Happy Winter, and Poinsettia Greetings! Here's how it will work: you leave a comment on my blog under the post of the giveaway you want to earn, and you must include your first and last name, and email address in the comment. You may comment only ONCE per giveaway post, or all your entries will be discarded. HOWEVER, if you refer a friend who enters in accordance with the rules, and they choose to also mention your first and last name, and email address, in their comment--they get an entry PLUS you get another entry! So, if you see a giveaway you really, really want, enter yourself and then go email everyone you know and send them to the blog post to comment and mention your name!!! DISCLAIMERS: One winner per name, delivery address, and/or email address during the 12 days, please. No purchase necessary to enter, however, each separate purchase from my ONLINE STORE will give you 10 Bonus Entries that will remain in the pool from the time I receive notice of your purchase, until the end of the giveaways. Winners will be chosen randomly and will be emailed the morning after the giveaway was posted, and MUST claim their prize by providing a valid postal address for delivery within 24 hours. (If you want to give the prize as a gift, by having me mail it directly to a third party, be sure to let me know so I can wrap and label it appropriately!) Prizes will be delivered via Priority Mail to U.S. addresses only, and may require the addressee's signature on delivery--so you need to give me the correct information to ensure your prize can be claimed. You must know the laws of your own state, and it is your responsibility not to enter if this giveaway is prohibited by your state law. Starting on December 13th, going through December 24th, I will once again be offering Twelve Days of Blog Candy! Every day for 12 days, I will offer something different...it may be for everyone, or you might have to be chosen to win. 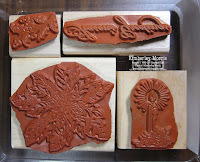 It will most likely be a used/retired item, or collection of items, from my stampin' stash. 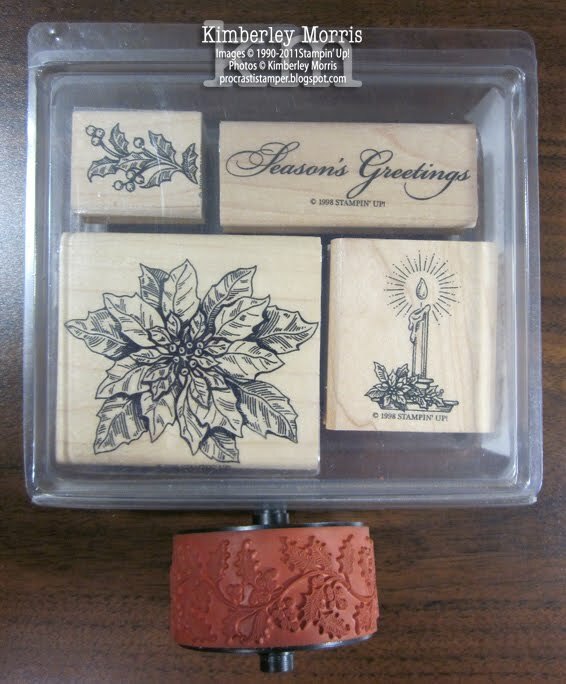 I have given away stamp sets, usually with a coordinating wheel if available, and/or coordinating patterned paper, coordinating ribbon or other embellishement, and/or a coordinating punch. See the pic below for samples of past giveaway items. You'll want to Subscribe to My Blog in a Reader, or Subscribe to My Blog in Email, to ensure you don't miss a single one of my Twelve Days of Blog Candy! Also starting on December 13th, going through December 14th ONLY, is a special SALE when you PURCHASE A STARTER KIT that I am authorized to offer to you!!! This limited offer is available only through Stampin' Up! Leadership Conference registrants such as myself, and only on December 13th and December 14th, 2011. During this sale, you can Become a Demonstrator for only $125 (reg. $175), PLUS receive your choice of either: a FREE package of Designer Series Paper, or a FREE digital download each month in 2012 (excluding January). The value of the product in the Starter Kit is over $335, and you can get over $100 more in product with these bonuses! 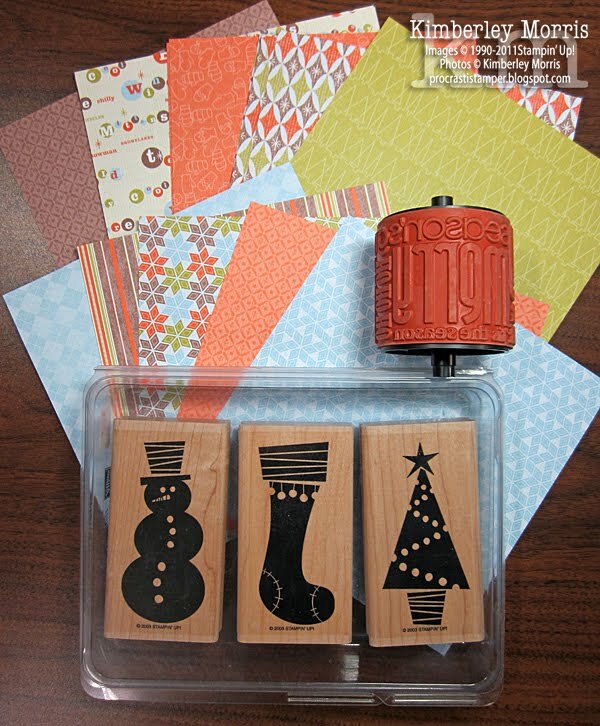 Purchase a Starter Kit, it is customizable (you can pick the stamps and colors you want), so it makes a great HOLIDAY GIFT for yourself--just ask Santa for your holiday money on December 13th or 14th! I moved the ear tuft pieces farther into the owl's head, because my son said it looked more like a Gremlin (actually Mogwai) than an owl when they stuck out more. 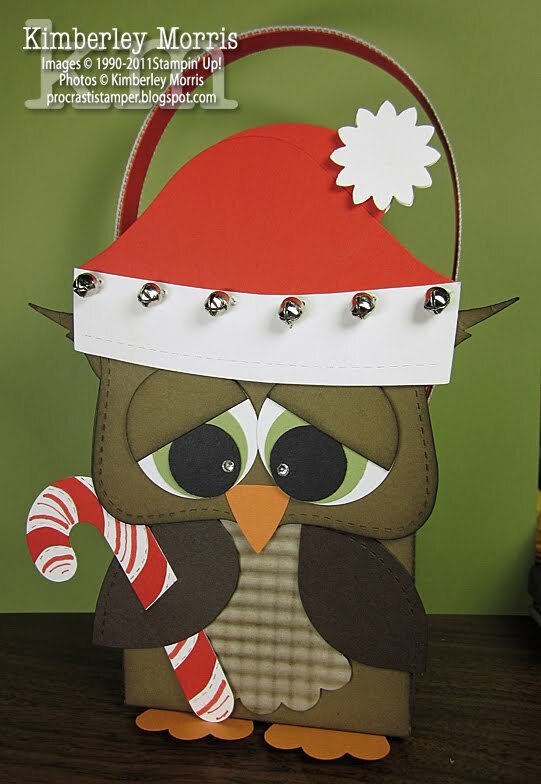 And I changed the color of the eyes, so all the card stock you'll need for this project can be found in the Neutrals Collection, and the 2010-2012 In Color Collection, so you can just buy those two assorted packages and be done with it. The handle is optional, so just skip it if you don't want to invest in the ribbon and brads. And for those of you who love penguins, I'm sure you can see how easy this would be to modify :-) I'll see if I can work one out for tomorrow--if I don't cough up a lung first. Sorry the lighting in these pictures stinks, I would have shot them outside except it was snowy and windy all day! 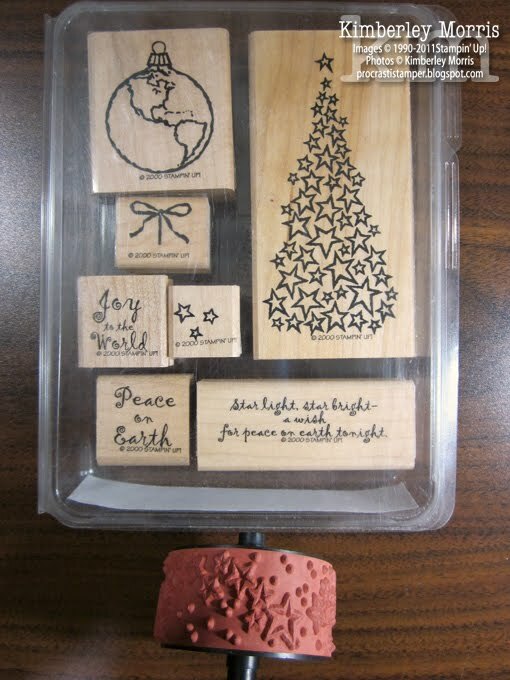 Stampin' Supplies: Big Shot die-cutting machine, Fancy Favor Box die, Top Note die, Holiday Stocking die, Stocking Accents die, 2-3/8" Scallop Circle Punch, 1-3/8" Circle Punch, 1" Circle Punch, 3/4" Circle Punch, XL Oval Punch (to take "bites" out of scallop punch pieces for belly and feet), Heart to Heart Punch (beak), Boho Blossoms Punch (pom-pom on hat), Crimper, Early Espresso ink & Stampin' Sponge, Early Espresso card stock, Soft Suede card stock, Crumb Cake card stock, Whisper White card stock, Pear Pizzazz card stock, Poppy Parade card stock and Poly-Twill Ribbon, Basic Black card stock, Peach Parfait card stock, Mini Glue Dots, Sticky Strip, Mono Multi Glue, Stampin' Dimensionals, Rhinestone Gems, Jumbo Brads - Neutrals (to hold the ribbon handle on each side of the box), Crop-a-Dile (to punch holes thru ribbon and sides of box).